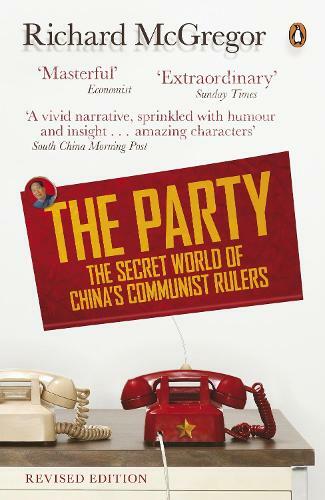 Richard McGregor's The Party has been established as the book on China and its political leadership. It is indispensable to understanding what may soon become the most powerful country on earth, and here is it is newly updated to include material on the once-in-a-decade leadership changes taking place in November 2012. Newly updated version including analysis of the once-in-a-decade leadership changes taking place in November 2012 China's Communist Party is the largest, most powerful political machine in the world. Here, Richard McGregor delves deeply into its inner sanctum, revealing how this secretive cabal keeps control of every aspect of the country - its military and media, legal system and businesses, even its religious organizations. How has the Party merged Marx, Mao and the market to create a global superpower? And what does this mean for the world? 'Extraordinary', Sunday Times 'Masterful ... entertaining and insightful', Economist 'Superb ... an essential, riveting guide to how the rising power really works', Jonathan Fenby 'If you read only one book about China this year, it should be this one. And if you do not read this book, you probably do not understand China today', Arthur Kroeber, China Economic Quarterly 'A compelling exploration of the world's largest and most successful political machine', New Statesman 'A book that is as informative as it is entertaining ... China has been transformed. The system that takes the credit is brilliantly described by McGregor', Chris Patten, Financial Times Having joined the Financial Timesin 2000 in Shanghai and being appointed China bureau chief in 2005, Richard McGregor is now Washington Bureau Chief for the FT. McGregor has won numerous awards throughout his nearly two decades of reporting from north Asia, including a 2010 Society of Publishers in Asia Editorial Excellence Award for his coverage on the Xinjiang Riots and 2008 SOPA Awards for Editorial Intelligence. He has spent twenty years in north Asia, starting in Taiwan, and then in Tokyo, Hong Kong and Beijing, where he established offices for The Australian newspaper. He has also contributed articles and reports to the BBC, the International Herald Tribune and the Far Eastern Economic Review.